Companies like Google, Amazon, eBay, and Uber are operating and expanding services that allow shoppers to order something online and have it that same day, without ever leaving home. If they manage it, despite the expense and complexities involved in delivering over the “last mile,” these companies will grow e-commerce’s customer base (as well as its share of retail dollars), and siphon off one of offline retail’s last real competitive advantages. 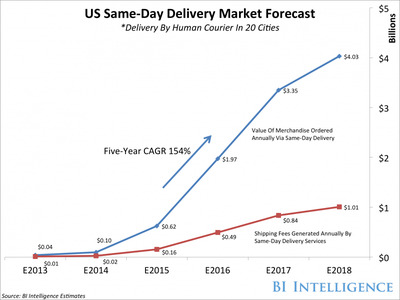 In a new report, BI Intelligence takes an exhaustive look at the same-day delivery market, sizing the percentage of people who will purchase goods to be delivered the same-day this year. We uncover the demographics of same-day delivery customers, the markets where these services have the best chance of taking off, and assess how each of the many new same-day delivery entrants compares to the others. We also look at the technology that really could make getting a package delivered to your door hours after you order it a common phenomenon. USE: BI Intelligence estimates that 2% of shoppers living in cities where same-day delivery is offered have used such services. In dollar terms, we estimate that roughly $US100 million worth of merchandise will be delivered via same-day fulfillment this year in 20 US cities. 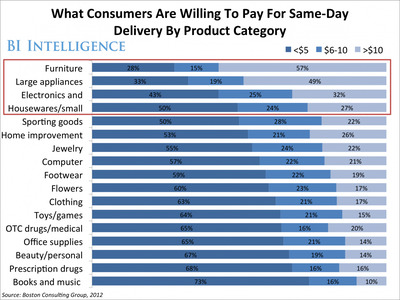 CONSUMER EXPECTATIONS: Consumer interest in same-day delivery is already fairly high. Four in 10 US shoppers said they would use same-day delivery if they didn’t have time to go to the store, and one in four shoppers said they would considering abandoning an online shopping cart if same-day delivery was not an option. DEMOGRAPHICS: The most common same-day delivery shopper fits a very specific profile — millennial, highly likely to be male, urban-dwelling, and young. 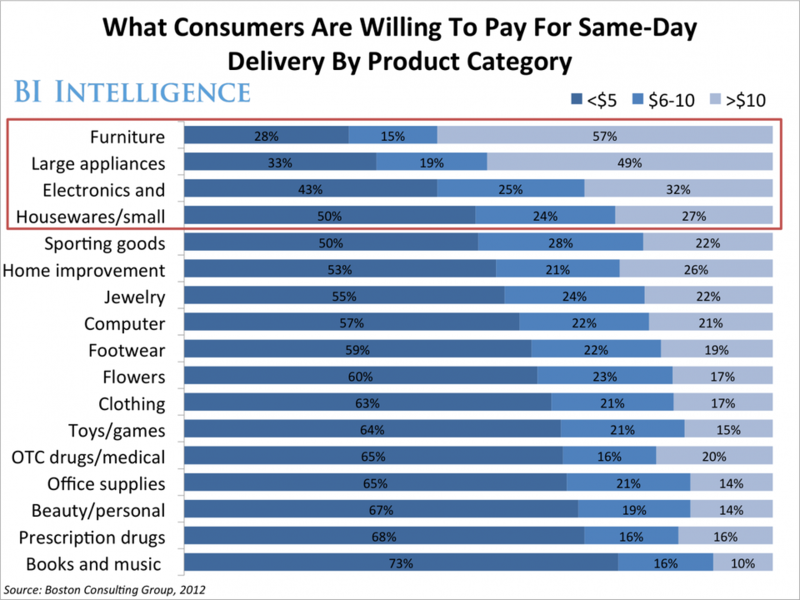 The products people want delivered same-day are also fairly niche. BARRIERS: Despite all the competition in the same-day delivery market, it still won’t be easy to get people to pay for these services. 92% of consumers say they are willing to wait four days or longer for their e-commerce packages to arrive. To access the Same-Day Delivery Market Forecast Report and BI Intelligence’s ongoing coverage on the future of retail, mobile, and e-commerce — including charts, data, and analysis — sign up of a free trial.